All right then: first up, down in one of the strangest constituted areas of London, Greenwich + Docklands International Festival continues to steal circus, street arts and visual theatre in among the weekend-empty, immense, hive-like buildings of Canary Wharf; into manicured parks and smooth redeveloped quays; and, daringly, over the façades of grand buildings like the stout old Royal Naval College. 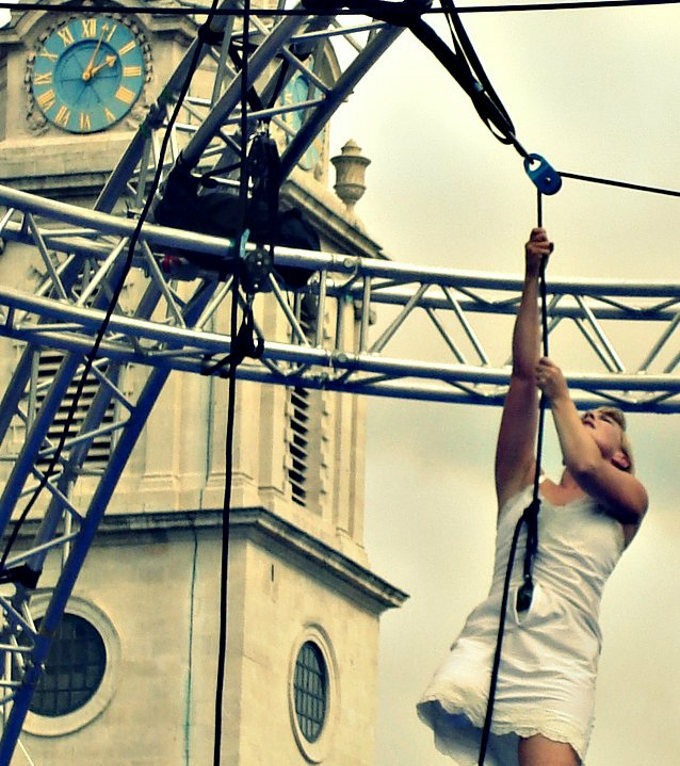 GDIF's always programmed small street shows alongside mighty spectacles, but this year there's also an annex to the main festival, Greenwich Fair, GDIF's genteel revival of an ancient London tradition of debauched carousal. It's presented in association with FiraTàrrega and pulls together a strand of outdoor work that includes some circus companies: Acrojou (showing a reworked Wheel House), trampolinist Max Calaf, collaborating Catalan companies Res de Res and Circo Dux, and Company FZ, delivering their swansong performances before founder members John-Paul Zaccarini and Flick Ferdinando dissolve the company and go their separate ways. Also in the GDIF programme is a performance of Gandini Juggling's work of precision ensemble teashop chaos, Smashed!, and two big Without Walls commissions: Heartland, a collaboration between Scarabeus, Candoco Dance Company and writer Nicky Singer that centres itself on the Icarus and Minotaur legends, and As The World Tipped, harness aerial specialists Wired Aerial Theatre's collaboration with the director Nigel Jamieson 'dramatising the Copenhagen Conference on climate change'. Festival juggernaut Watch This Space – this year running a full 10 weeks – is one of my favourites: I always think of it as a sort of Bayeux Tapestry of outdoor performance rolling out over the entire summer. As last year, the 2011 festival begins with a series of week-long residencies, and once again Gandini Juggling are onboard, performing sundry repertoire pieces alongside their 2010 WTS commission Smashed! and a new piece that will be put together during the residency week, Blotched. Circus Space are also returning for stay, showing their ensemble third-year show, The Other Road – and of course it's anyone's guess how it'll turn out, but last year's ensemble piece, Step it Out, directed by Sue Broadway, was good (it picked for its narrative a glossy fashion parade and in doing so discovered the perfect setting to galvanise the camp exhibitionism apparently universal to CS students). Then in the main programme there's Ockham's Razor (with The Mill), Atempo Circ (whose show last year, Atempo, was probably the best thing I saw outdoors in 2010), Circolombia, The Chipolatas, ThisSideUp Acrobatics (who last time they were in London were placed just a little way down the South Bank in the wretched, seamy gut of the Udderbelly cow – this is probably a better place to meet them), Circo Ripopolo, Mimbre, and more. Now in the process of pulling its act together, Winchester Hat Fair, the UK's oldest street arts festival, has always had a reputation as a higgledy-piggledy and ad hoc affair – it felt like the acts had just sprayed out of an overpacked suitcase, and it was always best to come without plans and just wander around Winchester's picturesque streets and lovely cathedral grounds, falling over performances. Showing short work this year, there's tightwire specialists Dizzy O'Dare and French street arts maestros Les Apostrophes, plus there are large-scale works by Scarabeus and Candoco (with Heartland – see above) and by NoFit State Circus (with Barricade, a supersize ZEPA commission for an audience of thousands). Up north, in Barrow, a town with a rich legacy of outdoor arts thanks to the seven-year residence of Welfare State International (cf Eyes on Stalks), relative newcomer Zircus Plus is an outdoor festival dedicated to circus. There's a lot of shorter performance and walkabout from Aristokraten, Ecocentrics, George Orange, Ian Marchant, and others, but also some appetising longer works: an object animation piece from the Italian-Belgian company Piano C that uses discarded trash as props; Leo and Yam's Some Like It?, an aerial duet built from a silent intertitled noir story, some great doubles rope material, and the surely by now de rigueur Leo and Yam genderbending; plus Heartland (see above, again – it gets around a bit). A couple of indoor shows have also been sneakily programmed: PanGottic will be presenting Full Twist and DeFracto Circuits Fermés, the technically virtuosic juggling two-hander that made them 2010 Jeunes Talents Cirque Europe laureates and set them on their current frantic schedule of international touring. So rudely loud and overbearing in the general theatrical calendar, the Edinburgh Festival Fringe has never meant that much to the circus world. In future years, with the establishment of (it's rumoured) dedicated training and creation spaces in the city plus a Fringe venue with the facilities to programme aerial work (which is getting a trial run this year as part of Leith on the Fringe), that might change; for 2011 there's not so much to make you travel. Circolombia will no doubt have great success at the Assembly with their raucous and demotic show Urban, but there are a couple smaller productions worth a look. At Out of the Blue Drill Hall as part of Leith on the Fringe, This Twisted Tale is an unknown quantity, a Bay Area US import, but there's interesting aerial technique coming out of California, and San Francisco is a particular hotspot for circus activity – so give it a go perhaps. Sideshow's heard a certain amount (from an at best semi-reputable source) about Ramesh Meyyappan's Snails and Ketchup, another adaptation of Italo Calvino's much-treated (by circus artists) Baron in the Trees, and is intrigued. And then at Zoo Southside, one of the few Fringe venues to have a coherent programming identity, Cirk Putyka are presenting La Putyka, a piece about Czech pub life which began from a contentious and appealing wish to make circus that wasn't inspired by the French poetic style. And then finally, slotting in between these larger clusters of work, there are isolated outbreaks of circus dotted over a few broader festivals: the big circus show at Glastonbury this year is Barricade (see above), but as usual there'll be a strong multi-threaded programme of cabaret and short-act work in the various tents of the circus field; up in Glasgow, the second edition of the Surge Festival has moved more towards street arts, but there's a clown cabaret curated by Angela de Castro, plus an interesting professional development initative, the Surge Labs; Stockton International Riverside Festival has yet to announce its programme but is always good for a couple circus performances, and usually one or two from across the Channel; after last year performing The Mill in Paternoster Square (outside St Paul's Cathedral) Ockham's Razor return to the City of London Festival, and to the Square, with a double-bill of previous shows Arc and Every Action..., and Upswing will be showing three new, short aerial solos; and, as every year, the Circus Stage will be the best place to be at the annual Bristol Harbour Festival: its continuous, all-day programme of short acts draws on Bristol's deep resource of technically-minded artists, and it's located in the natural amphitheatrical bowl of Castle Park, the only comparatively calm and free space in a festival that has otherwise become swollen and unnavigable.